I can't believe there isn't a dedicated thread for this place. I finally got over here today (even though it is only 2 blocks from my house). My visit was long overdue considering this place has been open for awhile and accumulating accolades. The shop is really small, only three tables. There is a cooler adjacent to a counter that is chock-full of delicious-looking pies. I went in today for something savory (heresy, I know). I settled on the chicken pot pie, which was carefully packed in this to-go box with re-heating instructions. For those of you who are keeping count, this was a bottom & top crust pie. If there was one deficiency to this pot pie, it was that the bottom crust gets lost in the filling. This, however, did not detract from my enjoyment, though. One pie cost $9, but I think it is sufficiently large for two meals. I can't wait to go back and try more. 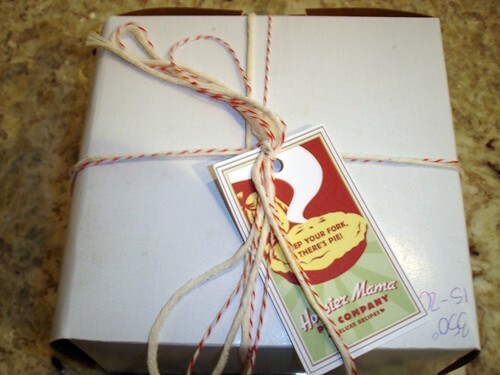 I love Hoosier Mama Pies. Best around, and the apple pie is the only one in town that I want to eat. I think you're being overly hard on yourself for not getting there yet. They've only been open for 6-7 weeks or so. Paula is making Chicken Pot Pies now? Very cool. They had a booth at the Green City Market on Wednesday. They had samples of something called Chess Pie, the crust was tender and flaky and the filling was good, too. Quite a few people were buying pies. I'm not 100% positive, but I think they only had dessert pies at the market. Only problem I have with this wonderful bakery is that the pies are $20 - right? So they're great for a special occasion, but it's not that hard to make a good fruit pie for a lot less than that. Still, it's so nice to finally have an answer for all those times where someone asks "where can I get good pie in Chicago?" And I've gotten that question a lot! Vitesse98 wrote: Only problem I have with this wonderful bakery is that the pies are $20 - right? So they're great for a special occasion, but it's not that hard to make a good fruit pie for a lot less than that. Still, it's so nice to finally have an answer for all those times where someone asks "where can I get good pie in Chicago?" And I've gotten that question a lot! I don't think the issue is whether or not one can make a good fruit pie for less money. Of course one can if they place no value at all on their time. Between shopping for ingredients, making the dough, rolling it out and baking, a pie will take at least an hour to make and almost certainly more. And even then, would it be as good? Perhaps it would but Ms. Haney's pies are pretty awesome. But on top of that, the meaningful comparison is whether one could buy a better pie in Chicago for less money. In my experience, the answer is no. Perhaps others feel differently (and if so, I want to know where). The bottom line for me is that pie is a special occasion food and I'd rather spend $20 on an exemplary one than $15 on a good one. ronnie_suburban wrote: But on top of that, the meaningful comparison is whether one could buy a better pie in Chicago for less money. In my experience, the answer is no. Perhaps others feel differently (and if so, I want to know where). The bottom line for me is that pie is a special occasion food and I'd rather spend $20 on an exemplary one than $15 on a good one. Well the best pie I've ever had in my life was a Jimmy Jamm's sweet potato pie on the south side. Nothing has really come close. A whole pie will run you $10. How are their fruit pies (since that's what the post I was specifically responding to mentioned)? I'm not much of a sweet potato pie fan but I do enjoy fruit pies. FWIW, I don't think $20 is a lot to pay for a HM pie. Pies are somewhat labor-intensive and quirky. Good quality fruit ain't cheap. Sooo... $20 for a Hoosier Mama pie seems fine with me in lieu of making one, and I say that likin' to make pies. We've taken out from there on a number of occasions and everything we've had has been awesome. We especially are fond of the Hoosier Cream, which is described as "A sweet creamy brown sugar filling inside a buttery pie crust." But we've tried about six or seven different pies thus far and have yet to come across one we didn't love. Another treat: last time we were in there was a jar of pie crust cookies, 25-cents apiece and addictive. One of my favorite coffee shops in the city, Noble Tree in Lincoln Park, have a nice selection of Hoosier Mama pies for purchase by the slice. A great cup of Metropolis coffee and a slice of pie, with three levels of seating, free wifi, and electrical outlets as far as the eye can see? Now that's what I call breakfast! Didn't know you were talking about fruit pies. Jimmy Jamm only does sweet potato. What's the best Hoosier Mama pie? I was thinking of picking up a strawberry rhubarb. I think Ronnie hit it on the nose. While one could easily make a pie for much less, Paula's pies are exceptional. I for one could never make a pie that even comes close to that quality, and I even doubt my mother, who has been baking for over 70 years, could do it either. Ms. Haney was, afterall, the pastry chef at Trio under Grant Achatz. $20 does not seem like much for a pie with those creds. Is it whole pies only or can a brother just get a slice? 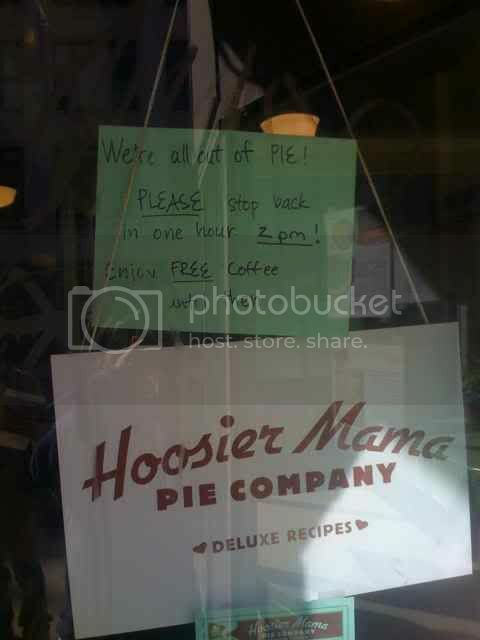 i stopped by hoosier mama last week to pick up a pie (closed on monday btw) hoping to get a coconut pie. not on the menu that day so went for hubby's favorite, lemon merinque. the pie was so tart we could not eat it. i think my husband finished his piece, daughter and i could not. ended up throwing 3/4 of it away. i was very disappointed and thought about taking it back but i figured it was a one off. i will try them again, crust was great, just not lemon merinque. anyone else experienced this? Jazzfood wrote: Is it whole pies only or can a brother just get a slice? A brother can get a slice. A slice and a hefty cup of Metropolis coffee runs like 5 bucks or so. d4v3 wrote: Ms. Haney was, afterall, the pastry chef at Trio under Grant Achatz. While I agree and Ronnie's observation stands, my experience teaches me that I wouldn't put too much stock in someone being a pastry chef as some gold standard that separates home bakers from pro bakers. Yes, working for Grant Achatz is generally worth something based on his high standards, but there are plenty of people who are as good or better bakers than some of Chicago's supposed pastry mavens. Wow, nobody saw Steve Dolinsky last night? It just so happens The Hungry Hound did a feature on Hoosier Mama on the very day this thread was started. BuddyRoadhouse wrote: Wow, nobody saw Steve Dolinsky last night? It just so happens The Hungry Hound did a feature on Hoosier Mama on the very day this thread was started. Again, these pies are great. And for some of the tougher/trickier pies, definitely saves some time (or, in my case, surmounts baking deficiencies!). But for most fruit pies, the only ingredient I generally don't have around the house is the fruit, and buying a handful of pears or apples isn't that hard or expensive. Just saying, $20 is not that cheap, pastry chef cred or not, for something I could conceivably make at home (vs., say, a pie from Burt's ) Now, it's definitely defensible, as a price. Just not cheap. Of course, that's less of an issue when you're talking by the slice! went by there today at about 2pm and they were out of pies. special order pickup only. that was quick. abolt wrote: went by there today at about 2pm and they were out of pies. special order pickup only. that was quick. Less than 24 hours from the first LTH post. That must be some kind of record. I'm not sure LTH had too much to do with this. They've been very popular for some time now (with plenty of press), it's the day before Mother's Day, and the first Saturday of the Green City Market, where Hoosier Mama sells pies. And, as noted above, Steve Dolinsky did a report on this place last night. riddlemay wrote: Less than 24 hours from the first LTH post. That must be some kind of record. eatchicago wrote: I'm not sure LTH had too much to do with this. They've been very popular for some time now (with plenty of press), it's the day before Mother's Day, and the first Saturday of the Green City Market, where Hoosier Mama sells pies. gleam wrote: And, as noted above, Steve Dolinsky did a report on this place last night. All in all, some nice synergy. Btw, I think they sold out of pies on some earlier day, too (I remember reading a post about it somewhere). They sold out on opening day--we went and Paula hand wrote a rain check for a free slice. Having demand outstrip supply, in this case, I think adds to the allure. After all, there are precious few other options for a real good slice of pie in the city and none I can think of up here in the Northern Burbs. You think $20 is a lot to pay for a pie? Check this out. AlexG wrote: They sold out on opening day--we went and Paula hand wrote a rain check for a free slice. Having demand outstrip supply, in this case, I think adds to the allure. I arrived shortly after they ran out of pie on opening day. I'm glad that supply hasn't really been an issue since. I live ridiculously close by, and I feel pretty darn lucky to be able to walk down the street and have an excellent slice of pie almost whenever I want. When it comes to pie, scarcity isn't alluring. I had the Chocolate Chess Pie. It's basically a chocolate brownie in her fantastic pie crust....seriously what's no to like. But even better was the Strawberry Rhubarb! I bought a whole one a few weeks ago and it was so good my family and I could hardly speak while we ate it, and needless to say the pie was a memory within about 20 minutes of our first bite. I HIGHLY reccomend this pie. I had ordered it a few days in advance and it was ready with my name on it when I arrived to pick it up. Lovely! I can't wait to try her others. We live in walking distance, but I need to space out my pie-buying so I don't have to get bigger jeans! The pies from Marilyn's Bakery in Hobart, IN are very good and (I think) don't cost quite as much as Hoosier Mama (which I have not tried). They are sold at a few farmer's markets in the area. It is also worth a stop on the way to or from Michigan. I would make the drive just for the pie if I couldn't get it any other way. I confess I cannot get past the apple, as that is my favorite fruit pie and Marilyn's is so good I crave it above any of the other flavors. DH is pretty loyal to the cherry pie. So I think the only other ones we have tried are the Very Berry and the Strawberry Rhubarb. 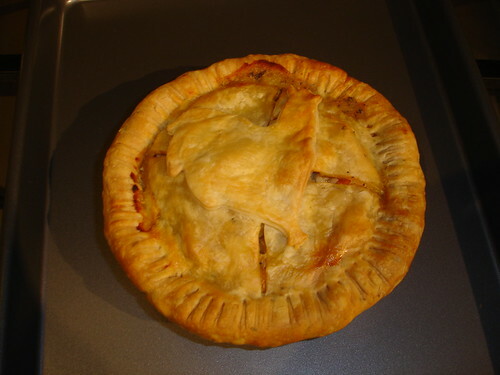 We have frozen these pies with great results, I can tell no difference from when we eat them fresh. Robert sells large and small pies and seasonal nutbreads in a variety of locations to bring the farm culture to you. You are welcome to call Marilyn's Bakery 219-962-BAKE and place your order to guarantee your pie. Please note, orders need to be paid in advance which includes pies and nutbreads. Special orders and refrigerated items are not available to the Farmer’s Market. I was at Marilyn's Bakery this winter, the cost is not as dear as Hoosier Mama Pie. I went to a program where there were a number of Marilyn's pies to sample. They were pretty good with most costing under $10. At her shop, they have quite a wide range of baked goods including Povitica, a Croation-Polish--Balkans dessert of ground walnuts in rolled into a pastry. 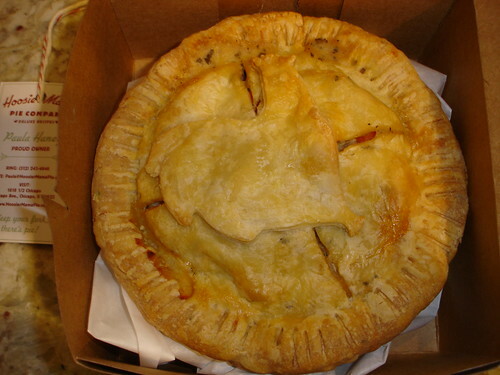 There are some locations selling Marilyn's pies in Illinois, you will have to contact Marilyn's to find out where.